And the day turned to night: The #Eclipse2017 as seen from Shaw Air Force Base over the F-16 Viper Demo Team. 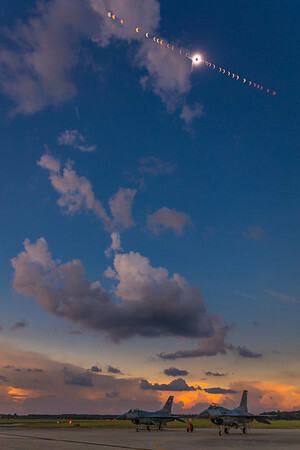 This is my first edit of the eclipse time-lapse. The total solar eclipse of August 21, 2017, seen from Shaw Air Force Base in Sumter, South Carolina. In the foreground are two F-16 Fighting Falcons from the F-16 Viper Demo team, parked at the end of the runway for us to use as subjects. 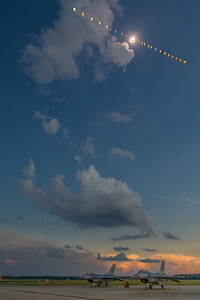 Composited into the image are shots of the Sun as it marches toward (and then, away from) totality. I had set the interval timer to capture a frame every 5 minutes, but because of clouds (and, at times, rain), there is some inconsistency in the spacing and the exposure of the sun. 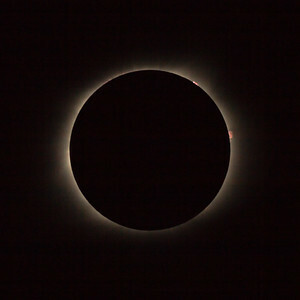 The images represent two hours of motion, with the first image taken at 1:46 pm (ET) and the last frame taken at 3:45 pm. And, because the sun was so high in the sky, I (naturally) framed the shot vertically and was shooting with a 17-40mm lens set to 23mm, on a full-frame Canon body. And, again, big thanks to the Public Affairs and Communication teams at Shaw Air Force Base and to the F-16 Viper Demo team for moving these planes into position for us, and for being so entirely hospitable to the We Report Space team.